Lieutenant-Commander Charlie Wines ended his naval career by spending some 22 years as the Drafting Officer in the Fleet Air Arm Drafting Office, mostly at HMS Daedalus, the second-line Royal Naval Air Station in Lee-on-Solent, the seaside town where he lived in Russell Close with his wife Betty and four daughters. He ran the section that dealt with the drafts (postings) of Fleet Air Arm ratings of the non-technical branches (Aircraft Handlers, Safety Equipment specialists, Meteorological Observers, Photographers) and naval Aircrewmen (who flew in naval aircraft at sea and ashore). This job was his last as a serving officer and he continued beyond the normal retirement age of 50 as a Retired Officer (that is, a civil servant) but wearing naval uniform as he was in a naval post. 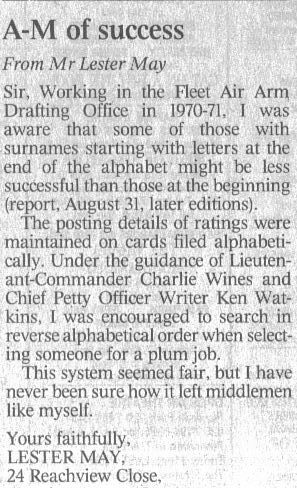 I was privileged to work for Charlie Wines, a legend in the Fleet Air Arm, for some eighteen months as a Writer rating until the end of December 1971 when I went to Dartmouth for officer training. Charlie himself, of course, had joined as a Supply Assistant (SA – the branch was later called Stores Accountant), before transferring to rating pilot, and was commissioned in 1944 having been advanced to POSA. My specialisation as an officer was as a ‘Pusser’ – a Supply Officer . Charlie was a character of the old school. He wore his cap at the jaunty angle, common in wartime but not regulation, he walked seemingly at the double and used surnames almost exclusively when talking of people senior or junior to him; I felt rather ‘chuffed’ that he always called me by my then nickname of ‘Elly’ (I was L E May). He knew many of the ratings of the Fleet Air Arm personally and would often add a personal comment on the draft order when signing it; he was much loved by the branch and his immediate staff. A man of the Turf, he was often on the phone to his bookie during afternoon race meetings! He never told stories of his wartime service or time as a PoW but did tell some of his time in the post-war Navy. A modest man, he’d have been embarrassed, I think, were he to have known how much he was admired. 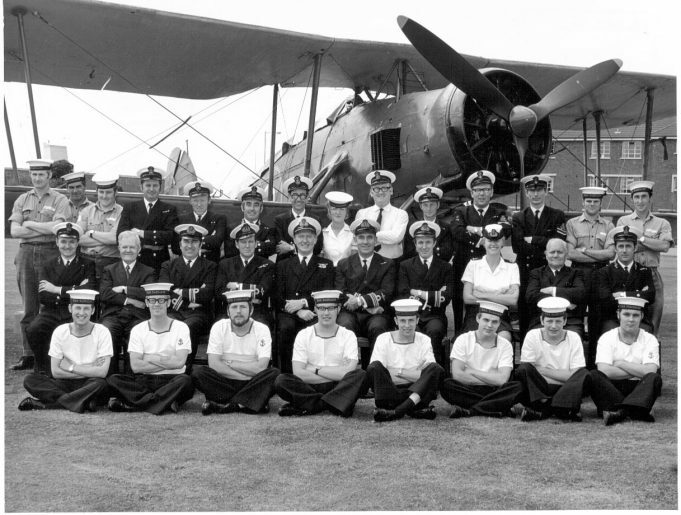 He arranged for the staff photograph to be taken in the summer of 1971, the Fairey Swordfish having flown into Lee for Air Day and the wardroom summer ball: Charlie Wines is easily identifiable, wearing his cap at a jaunty angle and I am front row, left.